•Uses Humor. The days of “lectures” are long gone. •Is willing to learn more about your group to further that connection. •Can offer some level of guarantee. You don’t need any risk. •Has a LONG list of clients who will vouch for the quality of the work. If you’re shopping speakers… you want to get it right. You want your people to hoist you on their shoulders, shouting your name in thanks. Check out these testimonials for my programs here. https://www.bradmontgomery.com/wp-content/uploads/2018/11/logo-1-495x198-1-300x120.png 0 0 admin https://www.bradmontgomery.com/wp-content/uploads/2018/11/logo-1-495x198-1-300x120.png admin2008-06-27 21:52:082017-05-25 17:30:55How to Choose the Right Motivational Speaker? George Carlin died. To be honest, he was never one of my favorite comedians, and of course I can’t see him in the corporate market. But his skills were unmatched. And the way he pioneered a style that so many others copies is undeniable. I have a huge amount of respect for him, and am so sorry to lose him. We’ll miss you, George. Thanks for paving the way. My last blog post was about the importance of customized humor for professional speakers. It doesn’t matter if you are a comedian speaker or a trainer or a seminar leader, you’ve got to have a handle on your client’s culture, lingo, and stress points. “Hey, great to be here at the Mayo Clinic, where you guys invented Cortizone! And then you GAVE it to the world! How cool is that?! strongly believe that if I can get the audience laughing at the beginning of the speech, I’ll have their undivided attention when I get to the “wisdom” parts of the presentation. If they are laughing, they are listening. And if they are listening, they are ready to learn. So… again… I spend a ton of effort on customized humor and comedy for every group… even the groups that want a strong business tie in. Back to that joke. I told that joke pretty much as it is written when I was there in Minnesota. If you read it, you realize that it isn‘t funny. But I can tell you that the Mayo folks laughed hard. Nobody told THEM it wasn’t funny. So by combining two truths — horrible parking and Mayo inventing and gifting Cortizone — you get a joke. An inside joke. You get customized humor. What’s my point? If you’re a speaker, you need to make sure you have some tightly targeted humor…. it creates a connection between you and your audience you wouldn’t believe. If you’re looking to HIRE a motivational keynote speaker, make sure your speaker can speak your language, knows you’re inside information, and — perhaps most important of all — knows how to use your culture to create some very funny humor. I just got the nicest email from one of my peers in the National Speakers Association, humorist speaker Bobbe White from Illinois. She read my article on how to test humor before going on stage, and flattered me with this cool email. Thanks Bobbe. You go girl! I wanted to let you know that I tried your suggestion and it was unbelievable!!! Thank you so much for letting the audience make my program . You are right on target. You can’t write copy like that!!! 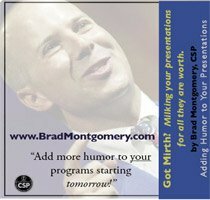 https://www.bradmontgomery.com/wp-content/uploads/2018/11/logo-1-495x198-1-300x120.png 0 0 admin https://www.bradmontgomery.com/wp-content/uploads/2018/11/logo-1-495x198-1-300x120.png admin2008-06-09 21:21:332016-09-15 06:32:08How To Test Jokes. Follow Up. learn the speaker biz, I hope you’ll come check me — and several other top speakers — out in this multi-day seminar. 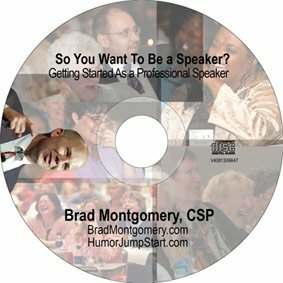 the real tips behind making a living in the professional speaker biz. I’ve done plenty of coaching of professional speakers. And I’ve also done lots of teaching speaking and comedy techniques to the National Speakers Association. But I’ve never tipped all of my best secrets in one place. And in California I get to do it all. Yeah, there is a fee to go. But if you’re interested in this crazy industry, this could be a pretty great deal. I’m excited for a few reasons: one of which is that this type of program is WAY far from what I normally do. Wish me luck. And I hope to see you there. https://www.bradmontgomery.com/wp-content/uploads/2018/11/logo-1-495x198-1-300x120.png 0 0 admin https://www.bradmontgomery.com/wp-content/uploads/2018/11/logo-1-495x198-1-300x120.png admin2008-06-03 18:26:192008-06-03 18:26:19What? I Might Be Crazy. Harvey Korman was one of my favorites. He died this week, and my heart was broken. I grew up loving the Carole Burnett Show. I loved him and Tim Conway. I loved everything about him. I often talk of him when I’m teaching comedy and presenting to other speakers. I talk about how much fun we had as an audience when they cracked each other up. I’m convinced there are MILLIONS of lessons in the way they handled that humor. Check out this cool link about from Entertainment Weekly. Speakers and comedians alike owe a bunch to this comedian. I’ll miss ya Harvey!